Loop around the famous Eton Dorney lake whilst racing the flattest course in the UK. Excellent racing atmosphere. With a great race atmosphere this really is one not to miss! Being the flattest half in the UK makes it ideal if you're pushing for a pb or if you're just starting out. Looping around the epic Eton Dorney Olympic lake make for a brilliant days racing. A well set out racing course, brilliant racing atmosphere and a medal for all finishers. This is a flat and fast one, after negotiating four and a half laps of the lake runners will have completed their half marathon. Located by the Main Marquee as you enter the lake on the right hand side. As you arrive at the event registration marquee a member of staff will give you your event number. 1. Bib number. To be worn on the front when you are running. 2. Depending on the number of competitors, you may be asked to have your event number written on your hand. Staff to write your number in permanent marker that washes off skin. Please car share as there is not unlimited space! 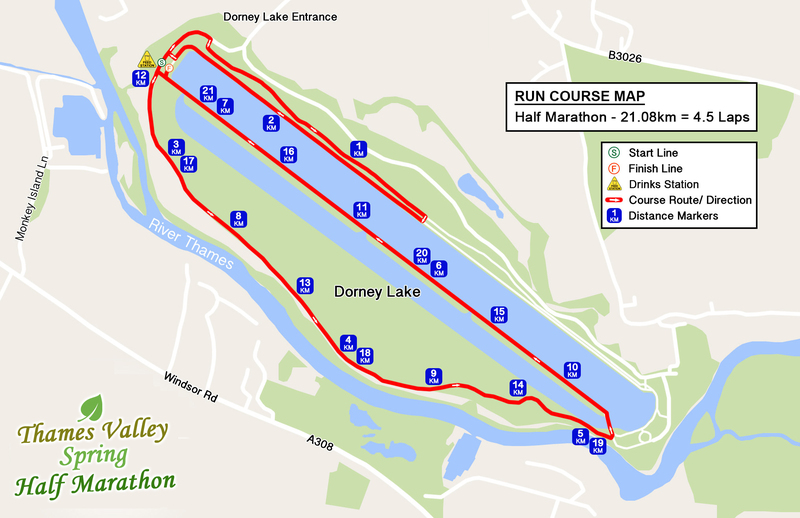 For this run around Dorney we suggest you bring your best road running gear. Plenty of space for all spectators, with food and drink available for purchase. There will be first, second and third prizes for the over male and female along with junior and vet prizes for the top one in each of those categories. The event was well organised with the exception of sending out the wrong start & arrival times via email, which were different from their website. Luckily we clarified with them beforehand as we would have missed the race start!It was a very fast paced course with a close time of 2hrs30mins, so my slower two run buddies raced their legs off to get around in time (there were many behind them) to collect their well deserved finishers medal. Some of the marshals were packing up 10minutes before the closing time, and we almost couldnt get a snack afterwards as the snack van was also attempting to close! It all felt very rushed at the end and geared towards serving the fastest finishers and club runners. I think if it were less rushed, giving even just an extra 15minutes for clear-up, the final runners would feel as important as the more speedy runners. I think this would also attract more participants. Overall, it was a good experience (as I really enjoyed the lapped course) and got a Pb of exactly 2hours! (5 minutes off my previous hm times.) Also, two of the course marshals were fantastic encouragers on the way around cheering on those who struggled!However, we wont be taking part in this one again due to the above. Marshalls were nice and helpful. Course was good for a first time but not wildly interesting. Id try it again to aim to improve my time. Hi there, the venue and registration opens at 9am, and the race starts at 11am. Hope you enjoy the event! Will there be pace makers at this event? Hi there. Just to let you know that unfortunately there won't be any pace makers at this event. Best of luck! Does it start at 11 or at 12.30?? Conflicting information!! Hi there, Just to let you know that the race starts at 11am. Best of luck!